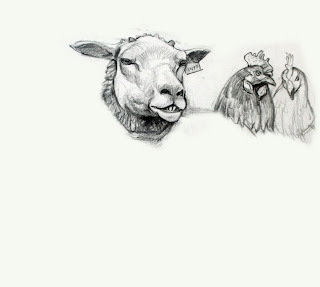 A while ago I went to a farm to get some practice sketching sheep and chickens. I was off to a good start with some head studies, but the animals got restless. They ran off before I could draw their bodies. Here’s what my sketchbook page looked like. That evening I went to a pub to have a beer and listen to some Irish music. A guy and his wife sat down at a table in front of me, perfect targets for a candid sketch. My book popped open to the half-finished drawing. Amazingly, the animal heads lined up with the human bodies. So I just finished the drawing without giving it another thought. No, I gestured. Don’t bother. But he staggered over anyway and stood beside to me, staring at my picture, grunting and hiccuping. Oh, great, I thought, I’m dead. He’s pissed off, for sure. How could I possibly explain this insulting portrait? 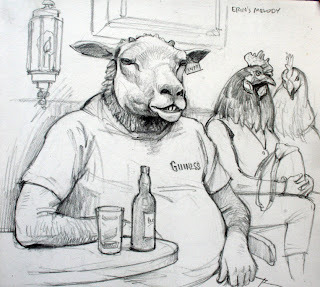 Especially since I made him a ewe and his wife was a rooster. But Herb didn’t say a word. He toddled back and sank into his chair and took a long, searching look at his beer bottle. Then he pushed the bottle away and never took another sip. Amazing drawings. I feel like there's a lesson here. That is hilarious. I have completed similar unfinished sketches, but never with such wonderful results. Made me laugh. There were these old group of European looking people who would take a walk every morning. There would always be an old man with a baseball hat and two old ladies that always fallowed behind. I'll have to fix it up some time. always love having a look at your sketches...keep em coming!! After seeing that, and contemplating his existence, he may never have taken a drink again, hah!